Located in beautiful Downtown Osoyoos, British Columbia, Coyotes Sports Simulation is the South Okanagan’s Home to 33 Different Golf Courses, including many on the PGA Tour. Coyotes Sports Simulation allows you to play courses from Pebble Beach to Banff Springs to St. Andrews! Need to improve your swing? Practice on an assortment of Driving Ranges. Want to sharpen your short game? Coyotes Sports Simulation also offers a variety of Putting Greens, as well as Miniature Golf. Indoor and completely climate-controlled, Coyotes Sports Simulation has two huge-screen simulators focusing on golf, but also provides the chance to shoot a puck past a Hockey goalie, kick a ball into a Soccer net and play four different Laser Shooting Games. Or let your imagina- tion run free with 25 Oculus Virtual Reality Games. Come by Coyote Sports Simulation for a FREE Demo or call Randy or Samantha at 250.495.5878 to book your time. 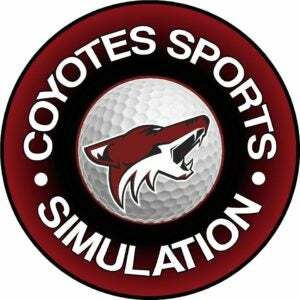 For more information on Coyotes Sports Simulation, please click here!